Q. From your point of view, what makes Novak so difficult these days? What are the key factors? RAFAEL NADAL: Everything. Hitting amazing. Well, the return always amazing. This year he serving great, I think. And then he is able to play with no mistakes and changing directions so easy, playing so, so long. He's doing everything good. He was better than me and he deserved to do what he did during the whole season. He played just fantastic. When somebody's doing like this, just the only thing I can do is congratulate him and just wish not the best of luck for the next year (smiling). Q. I observed in these last months you changed something about your forehand technique. I think you play more forward, more flat, less spin, you attack more. What is your next step of improvement in your technique? RAFAEL NADAL: No, my technique, we didn't try to change the technique of nothing. I think the technique was good. Another thing is the position on court. Another thing is the way that I play the points. I think I improved that a lot last couple of months. My next step is just keep practicing the way that I am doing. I know I need to keep improving things if I want to have chances against Novak next year. That's what I going to try. Just keep working the way that I am doing. I think I am doing well. Happy about the tournament. Happy about finish the season with that positive energy. Now I have a week off, and that's it. Q. Today did you think you felt the effects of your match yesterday against David, a long match? RAFAEL NADAL: No, no, I don't think so. Q. Is it tough not to feel frustrated in a match like that, or you just don't have time to be frustrated and you have to be concentrating on trying to turn it around? RAFAEL NADAL: You know, very few moments in my career I get frustrated. When one player is better than you, the only thing you can do is try to find solution. That's what I try during the match. But was not a real solution today. So just accept that the opponent is better than me today and keep working hard to try to reduce that difference that I believe in the last couple of months, because he cannot improve much, I think I could improve a lot, so I reduce a little bit the distance. Not with Novak, but with the rest of the top guys. I was able to compete with everybody. That's a big improvement for me. But that's not enough for me. I want to keep going and I want to feel myself better than what I am doing today for next year. I going to work hard to make that happen. Q. In the off-season do you and the other top guys think about, How can we beat Novak? He's always there at the end of every tournament. In most tournaments you have to beat Novak to win. RAFAEL NADAL: For the moment, yes. I never practice thinking about others. I practice thinking about what I have to do to be better, then we'll see if I am enough good. I think about my personal motivation to keep improving the things that we believe we need to improve to be better players, and that's it. Everyone has a different motivation. I never practice thinking what do I have to do to beat Novak, what do I have to do to beat Roger. My motivation has always been just personal, that I want to improve myself, I want to be better. That's what I going to try to keep doing. We'll see. 2016 going to be a new year. Hopefully better one for me. We'll see. Novak for the moment is almost unbeatable. As I say before, the only thing you can do is congratulate him. But things are like this today. You never know what's going on in the future. I have been in very good situations a couple of times, then I get some injuries, things change. Not everything is that easy. What Novak is doing is just amazing. But is obvious that it's true if somebody can do it, it's him, but it's not easy to stay at that high level four years in a row or five years in a row. Q. I don't know if you will watch it or not, but next week's Davis Cup Final, what are your thoughts on it? Do you think clay is a good surface for Belgium? RAFAEL NADAL: I don't know if I going to watch it. I have a charity event for my foundation, and Olazabal won. I probably going to be in the golf course doing the event. I don't know if clay is a good surface for Belgium or not. I think is the right one, yes. For Belgium is the surface that probably has a better chance because the second player of Great Britain is Bedene or who is playing? It's true that probably both players play better on hard than in clay. I don't think about Andy because Andy plays very well in every surface. But for the second player, I think for Belgium in his mind is probably try to win both points against the No. 2, then try to win the doubles. If I am Belgium, that's what's going to be in my mind. Then if I am able to win a match against Andy, fantastic. But that's what I believe they should think, and probably that's why they choose clay. Q. Back to you trying to beat Novak, but concentrating on your own game. In 2011 you lost seven finals against him. In 2012 and 2013 you were back beating him in majors at that stage. What did you do and are there lessons to learn to come back on how you maybe can beat him next year? RAFAEL NADAL: You ask me questions about the future. I cannot predict the future. I cannot say what going to happen in a few months, what going to happen in the next year. The only thing that I can talk is what can happen if I am able to keep improving, no? In 2011, I lost a lot of finals in a row. He was playing fantastic, too. I didn't play against him at the right level to compete against him. The last two finals that I lost against him before my first victory in Monte-Carlo I think was final of the US Open. That was helping me for the future. And of course to have final in Australia keep helping me for the future, too. I didn't have that kind of feeling, I was not that close against him yet. Against other rivals I was competing great, and that's it. As I said before the tournament, I was not able to think about Novak for the whole season. I have been playing in another league. Seems like the last month and a half, two months, I was in this league, I am in this top league. So my motivation and my goal is try to keep being in that top league, that is the top five, top four of the world. That's my goal, and we'll see if I am able to keep doing this. Q. You've had injuries in your career that have kept you off the tour. You're going to be 30 next year. After playing this season, how do you feel your body is? Are you more or less confident that your body is going to stay strong? Secondly, Novak tied his rivalry with you in his head-to-head. He has a chance to do that if he plays Roger. How important are these head-to-heads among rivals? 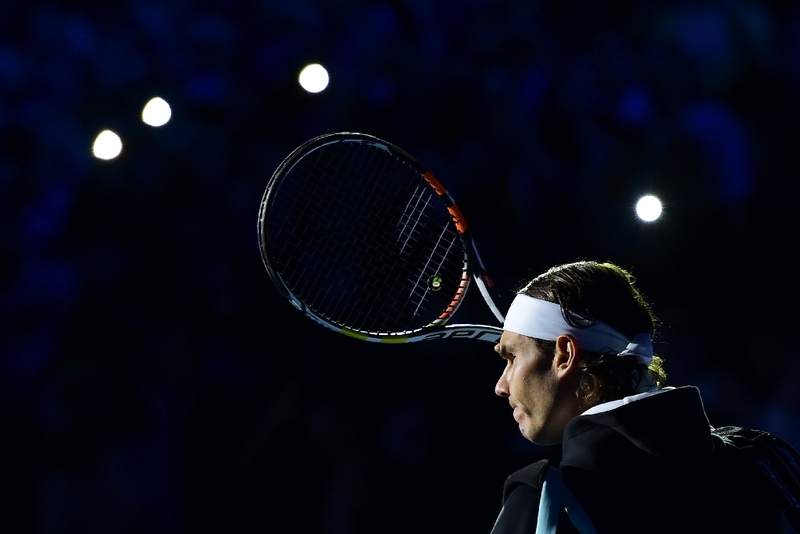 RAFAEL NADAL: I think the head-to-head records are a statistic one more. To analyze who is better or worst is a global thing, no? Is just one more statistic. Well, I think is fair and is great. I don't want to be arrogant, but between two good players, Novak and me, have a very tight head-to-head. I think that's normal. Is completely normal, and that's it. Q. And your body. How do you feel? RAFAEL NADAL: Today I'm feeling good. My body is healthy, is strong. I feel good physically. I am able to practice a lot. I am able to compete great in long matches, too. Today I am not worried about my body. I was much more worried when I started this season than how I am today. I played the full season with not many problems. I finished the season healthy, with good health. That's so important for me to keep practicing, have confidence in my body, my movements, and another important thing: if you want to improve your game, you need to practice. So for sure one of the reasons of my improvement is because I lost the strange feelings on court that I had during the season. Another reason is because I am able to practice as much as I can every day. That's a big help. Q. You just said that Novak was almost unbeatable. You played him at his peak. You played Roger at his peak. Is it possible or impossible to compare the two of them when they were at their very best? RAFAEL NADAL: Yeah, is possible but I don't want to do it (smiling). Thank you very much. Have a good Christmas and Happy New Year. See you next year.